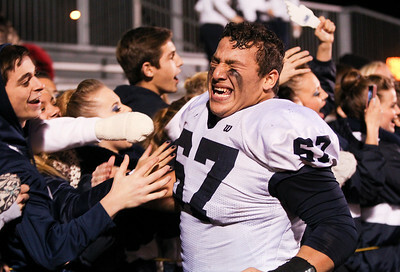 Sarah Nader - snader@shawmedia.com Cary-Grove's Ray Dimatteo celebrates after winning Saturday's Class 7A semifinal game against Libertyville November 22, 2014. 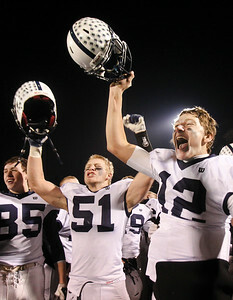 Cary-Grove won, 41-7. 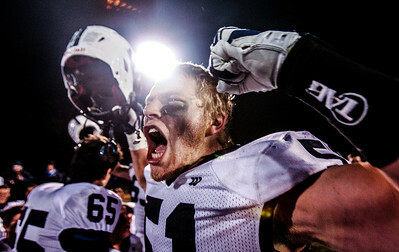 Sarah Nader - snader@shawmedia.com Cary-Grove's Trevor Ruhland celebrates after winning Saturday's Class 7A semifinal game against Libertyville November 22, 2014. 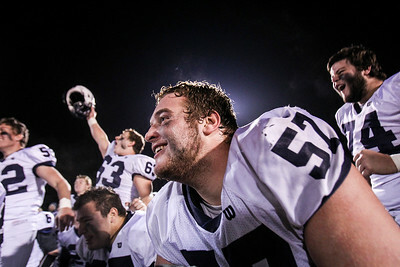 Cary-Grove won, 41-7. Sarah Nader - snader@shawmedia.com Cary-Grove's Ray Dimatteo (left) and Jason Gregoire celebrate after winning Saturday's Class 7A semifinal game against Libertyville November 22, 2014. Cary-Grove won, 41-7. Sarah Nader - snader@shawmedia.com Cary-Grove's Michael Gomez greets fans after winning Saturday's Class 7A semifinal game against Libertyville November 22, 2014. 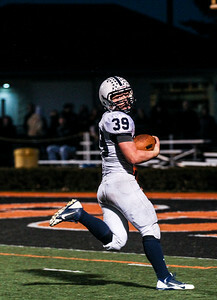 Cary-Grove won, 41-7. Sarah Nader - snader@shawmedia.com Cary-Grove's Jason Gregoire celebrates after winning Saturday's Class 7A semifinal game against Libertyville November 22, 2014. Cary-Grove won, 41-7. Sarah Nader - snader@shawmedia.com Libertyville's Nick Rossetti (left) is taken down by Cary-Grove's Larkin Hanselmann during the first quarter of Saturday's Class 7A semifinal game in Libertyville November 22, 2014. Cary-Grove won, 41-7. Sarah Nader - snader@shawmedia.com Cary-Grove's Larkin Hanselmann catches a pass during the third quarter of Saturday's Class 7A semifinal game against Libertyville November 22, 2014. Cary-Grove won, 41-7. 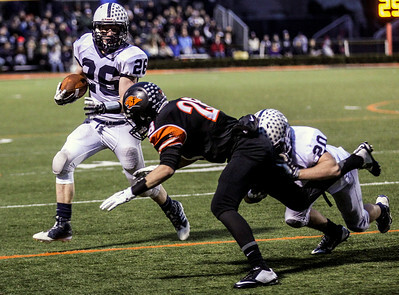 Sarah Nader - snader@shawmedia.com Cary-Grove's Matt Sutherland runs a play during the second quarter of Saturday's Class 7A semifinal game against Libertyville November 22, 2014. Cary-Grove won, 41-7. Sarah Nader - snader@shawmedia.com Cary-Grove's Kevin Hughes runs a play during the third quarter of Saturday's Class 7A semifinal game against Libertyville November 22, 2014. Cary-Grove won, 41-7. 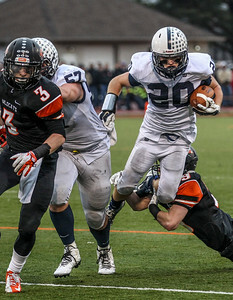 Sarah Nader - snader@shawmedia.com Cary-Grove's Tyler Pennington runs pass Libertyville's Abe Durrani while scoring a touchdown during the second quarter of Saturday's Class 7A semifinal game in Libertyville November 22, 2014. Cary-Grove won, 41-7. 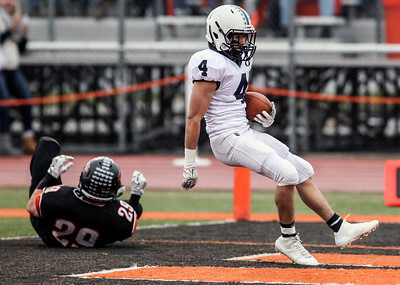 Sarah Nader - snader@shawmedia.com Cary-Grove's Tyler Pennington scores a touchdown during the third quarter of Saturday's Class 7A semifinal game against Libertyville November 22, 2014. Cary-Grove won, 41-7. Sarah Nader - snader@shawmedia.com Cary-Grove's Larkin Hanselmann scores a touchdown during the first quarter of Saturday's Class 7A semifinal game against Libertyville November 22, 2014. Cary-Grove won, 41-7. Sarah Nader - snader@shawmedia.com Cary-Grove players listen to the "National Anthem" before Saturday's Class 7A semifinal game against Libertyville November 22, 2014. Cary-Grove won, 41-7. 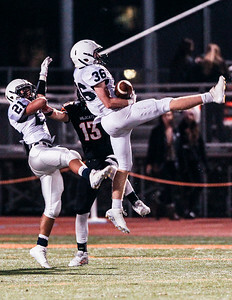 Sarah Nader - snader@shawmedia.com Cary-Grove's Willie Hartke (right) tries to intercept a pass to Libertyville's Jake Mansfield during the third quarter of Saturday's Class 7A semifinal game in Libertyville November 22, 2014. Cary-Grove won, 41-7. 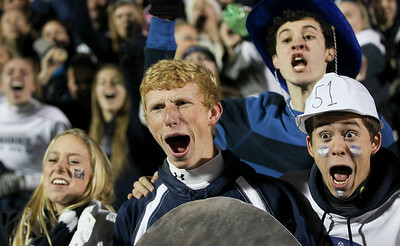 Sarah Nader - snader@shawmedia.com Cary-Grove fans cheer on the football team during Saturday's Class 7A semifinal game against Libertyville November 22, 2014. Cary-Grove won, 41-7. 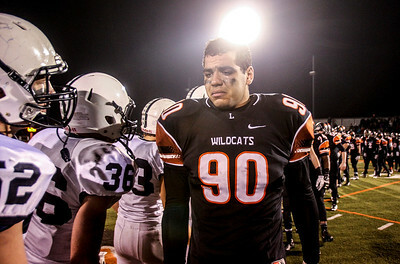 Sarah Nader - snader@shawmedia.com Libertyville's Matt Dunsing walks off the field after Libertyville lost Saturday's Class 7A semifinal game against Cary-Grove November 22, 2014. Cary-Grove won, 41-7. Sarah Nader - snader@shawmedia.com Libertyville's Riley Lees runs a play during the first quarter of Saturday's Class 7A semifinal game against Cary-Grove November 22, 2014. Cary-Grove won, 41-7. 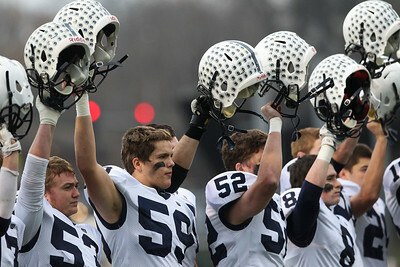 Cary-Grove players listen to the "National Anthem" before Saturday's Class 7A semifinal game against Libertyville November 22, 2014. 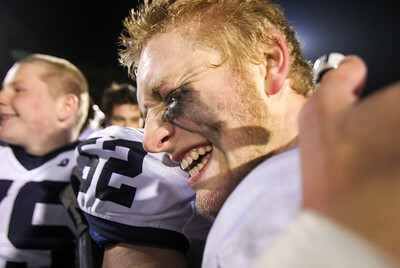 Cary-Grove won, 41-7.